I will begin posting some “recipes in progress” here. The first is from Morocco – I have been asked for it a dozen times since mentioning it here. Mostly, though, the recipes will be from closer to home, as I work on my new book The Country Cooking of Spain. This “salad” is often eaten as an appetizer alongside herbed olives and even small cheese-filled triangular cheese- or onion-stuffed phyllo pastries called rghaifs. The carrots are best served chilled with toothpicks to prod. Bring a large pot of water to a rolling boil and add salt. Add the carrots and boil until just tender, about 10 minutes. Meanwhile, fill a basin with cold water. Transfer the carrots with a slotted spoon to the cold water to stop any further cooking. Once they have cooled, remove with a slotted spoon and drain. Spread out on absorbent paper towels to dry. In a large sauté pan or skillet, heat the oil over medium heat. Add the carrots, season with the cumin, paprika, and pepper, and add the sugar. Cook, stirring gently, for 2 minutes. Remove the pan from the heat, add half of the lemon juice and dust with the parsley. Turn carrots over to evenly coat. Transfer to a bowl and let cool. Cover with plastic wrap and refrigerate until chilled. Just before serving, squeeze the remaining lemon juice over top and turn over to evenly coat. Serve chilled. All recipes are copyright Jeff Koehler 2009 and may not be reproduced without his written permission. 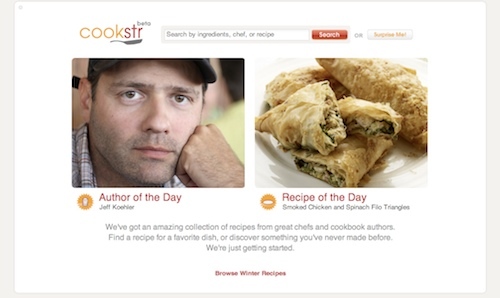 Check out the Cookstr.com website today - I am the featured author of the day. (The last week or two has seen the likes of Jamie Oliver, Dorie Greenspan, and Madhur Jaffrey as featured authors/chefs.) You can jump straight to my profile by clicking here. I have eleven rice recipes on the site (click here) - though the photos are up yet to match them. There are also links to buy the La Paella book, too. For more on Cookstr, read this New York Times piece. In Portland this summer to give a reading, I stayed with my old friend Jim Finley. He took me Sellwood to eat lunch at the taco cart on the corner of Spokane and 13th. A sudden shower drove us across the street into Vino to finish our fabulous tacos. Vino is a large wine store, airy, with a massive table and sense of community (not to mention a great selection of wine). The owner Bruce Bauer had not long before been in Barcelona, where he swooned over a breakfast of chickpeas with bits of blood sausage, raisins, and pine nuts at Bar Pinotxo inside La Boqueria market. “I want that recipe!” he said when he found out that I often eat this before shopping in the market. He took down from the shelf a fine local pinot and handed it to me. By the quality of the bottle I knew he was serious. So, here you go Bruce, my adaptation of Pinotxo’s recipe, with perdonas on its tardiness. It’s best for breakfast with a glass of wine and then a cortado (espresso with a shot of hot milk). I hope you enjoy this as much as I did the pinot. Soak the raisins in a glass of warm water for 10 minutes; drain. In a large skillet over medium heat, heat 2 tablespoons of the oil, add the onion, and cook until golden, 5 to 10 minutes. Add the reserved raisins, the pine nuts, garlic, and the botifarra. Cook, stirring and breaking up the botifarra until crumbled. Add the chickpeas and parsley, reduce the heat to medium-low, cover, and cook, stirring from time to time, until the chickpeas are hot and the ingredients well mixed. Divide among 4 plates. Add 1 1/2 tablespoon of oil to each, a dash of vinegar, and some flakes of salt. Serve. This recipe goes with my Washington Post piece on baking in a salt crust. The salt serves as a buffer between pork and hot oven, ensuring that no flavorful juices are lost. The Roquefort sauce offers a sharp counterpoint to the intensely flavored meat. In a large bowl using your hands, mix the egg whites and salt until salt feels thoroughly damp. Spread about 1/3 of the salt in the baking dish evenly. (You should have a layer about 1/2 inch thick.) Pat it down into an even layer. Place the pork on top of the salt and cover it completely and evenly with the remaining salt, patting the salt firmly onto the pork in an even layer about 1/2 inch thick. Be sure the entire piece of pork is thoroughly and evenly covered. Bake the pork until the salt forms a hard, lightly browned shell, about 50 minutes. (Figure 20 to 25 minutes per pound.) Remove the dish from the oven. To check if the pork is done without breaking away the salt shell, work an instant-read thermometer through the salt and into the center of the pork loin; it should register between 155 and 160 degrees. Bring the dish to the table with the pork still encrusted in salt. Bring a large bowl for the salt crust and a cutting board. Using a hammer, carefully break the shell open by tapping gently. Using your fingers, pull off the larger chunks of salt and discard. Transfer the pork to the cutting board. Using a pastry brush, brush away any remaining salt. (Some grains of salt may remain.) Cut the pork into slices about the thickness of a pencil and transfer to a platter. Serve with Creamy Roquefort Sauce on the side. This sauce also goes well with boiled or roasted new potatoes. In a small bowl, whisk the cream and cheese until it forms a thick, chunky mixture. Cover and refrigerate for at least 1 and up to 12 hours. Just before serving, remove from the refrigerator and whisk to recombine. Roasting an entire fish in a salt crust ensures it remains moist. Serve with a spoonful of rich pumpkin puree as a contrast to the lean but flavorful fish. Preheat the oven to 400 degrees. Have ready an ovenproof baking dish large enough to accommodate the entire fish (it may be necessary to trim the tail from the fish). Carefully rinse the fish under plenty of cool running water. Pat it dry with paper towels. In a large bowl using your hands, mix together the salt and egg whites until thoroughly combined and the salt feels completely dampened. Spread about 1/3 of the salt in the baking dish. (You should have a layer about 1/2 inch thick.) Pat it down into an even layer. Place the fish on top of the salt and cover it evenly and completely with the remaining salt, patting the salt firmly onto the fish in an even layer about 1/2 inch thick, so the outline of the fish is recognizable. Be sure the entire fish is thoroughly and evenly covered. Bake the fish until the salt forms a hard, lightly browned shell. Figure about 15 minutes per pound. Remove the dish from the oven and bring it to the table with the fish still encased in salt. Bring a large bowl for the salt crust. Using a hammer or wooden spoon, carefully break the shell open by tapping gently. Using your fingers, pull off the larger chunks of salt and discard. Using a pastry brush, brush away any remaining salt. Using a spatula and a knife, carefully lift off the top side of the fish and transfer it to a platter. (If desired, the skin can be removed, using a sharp knife.) Then remove the backbone and discard. Carefully transfer the bottom side of the fish to the platter. Cut into portions and serve immediately with the Quick Pumpkin Puree on the side. Although this pumpkin puree is intended as a rich-tasting garnish for fish, it is so simple yet delicious that you may wish to double the recipe and serve it as a side dish. In a small saucepan over medium heat, melt the butter. Add the pumpkin, season with salt and pepper to taste and cook, stirring frequently, until the pumpkin just begins to soften, about 5 minutes. Add the water, cover and simmer gently until the pumpkin is tender, about 20 minutes. (May need to reduce the heat to medium-low.) Remove from the heat; set aside to cool for at least 10 minutes. Transfer to a food processor or blender and puree until smooth. Season with salt and pepper to taste and, if desired, add the cream and puree again. Serve warm. This is Eli and Cesc’s version of the Catalan classic - see my article on Iconic Spanish Salads for more about it as well as other Spanish salads for summer. An excellent if much quicker substitution for the salt cod is high-quality, line-caught tinned bonito tuna in EVOO. The night before, put the dried beans (if using) to soak in abundant water. Drain, rinse, and drain again. Place in a large pot, cover with abundant water, bring to a boil, and gently boil until tender, about 1 hour. Add salt for the final 10 minutes of cooking. Drain the beans only when ready to use. Skin and carefully debone the cod. Shred into pieces by hand. Meanwhile, place the onions in a bowl, cover with water and a teaspoon of salt, and let sit for 1 hour. Drain, rinse, and drain again. Place the salt cod, onions, beans, tomatoes, green pepper, and olives in a large serving bowl. Add oil until moist but not pooling on the bottom of the bowl. Mix carefully. Cover, refrigerate, and chill while allowing the flavors to blend. Before serving, taste for salt and add if needed. Shake a couple of drops of vinegar over top if desired. Dust with plenty of black pepper. Note: Fesols de Santa Pau are very small white beans from the volcanic region near Olot; ganxets are a bit larger with slightly curling ends. Great Northern or cannelini beans are excellent substitutions. This Maltese rabbit and olive dish has become one of our favorites at home this year. It’s adapted from Matty Cremona’s A Year in the Country: Life and Food in Rural Malta, a lovely illustrated book published in Malta by Proximus Publishing, in 2003. In a large, heavy-bottomed casserole, heat the oil over medium heat. Dust the rabbit with flour and fry until golden. Sprinkle with sugar and cook until it’s dissolved. Pour over the wine vinegar and allow it to evaporate and slightly caramelize. Cover the pan, remove from heat, and set aside. In another small frying pan, heat the remaining 3 tablespoons of olive oil over medium heat and cook the garlic, onion, celery, and carrots with the capers and olives until the vegetables are soft, 10 to 15 minutes. Return the rabbit to low heat, spoon over the aromatic mixture the rabbit, add the rosemary and bay leaf, and cover with the stock and wine. Simmer, partly covered, for 60 to 90 minutes, until tender. Add more stock if it threatens to dry out. Roasting an entire fish in a salt crust ensures that it remains moist and that none of its natural flavors escape. Serve it with a spoonful of rich pumpkin puree as a contrast to the lean but flavorful fish. Preheat the oven to 400º Fahrenheit. Have ready an ovenproof baking dish large enough to accommodate the entire fish (it may be necessary to trim the tail from the fish). Spread about 1/3 of the salt in the baking dish forming a 1/2-inch-thick layer. Pat it down into an even layer. Lay on the fish and then cover the fish evenly and completely with the remaining salt, patting the salt firmly onto the fish into an even 1/2-inch-thick layer. Bake the fish until just done and the salt forms a hard, lightly browned shell, about 15 minutes per pound of whole fish. Remove the dish from the oven and bring it to the table with the fish still encased in salt. Bring a large bowl for the salt crust. Using a hammer or wooden spoon, carefully break the shell open by tapping gently. Pull off the larger chunks of salt and discard. Using a pastry brush, brush away any remaining salt. Using a spatula and a knife, carefully lift off the top side of the fish and transfer it to a platter. (If desired, the skin can be removed using a sharp knife.) Remove the backbone and discard. Carefully transfer the bottom side of the fish to the platter. Cut into portions and serve immediately with the Quick Pumpkin Puree on the side. In a small saucepan, melt the butter over moderate heat. Add the pumpkin, season with salt and black pepper, and cook, stirring frequently, until the pumpkin just begins to soften, about 5 minutes. Add the water, cover, and gently simmer over moderate-low heat until the pumpkin is tender, about 20 minutes. Remove from the heat; set aside to cool for at least 10 minutes. Transfer to a food processor or blender and puree until smooth. Taste for seasoning, adding salt or pepper if needed, and, if desired, add the cream and puree again until smooth. Serve warm. Escabeche is an ancient way of preserving fish, small birds, meat, even vegetables. In Spain it remains popular. We like small, finger foods best – quail, partridge, and sardines. Gently scale the sardines with a knife. Remove the head and guts in the following manner: hold the sardine with one hand and with the other rock the head first upwards breaking the neck, then downwards, and finally firmly pulling it towards you drawing out the guts. Run a finger through the cavity to make sure it is clean. Rinse well with cool, running water and pat dry. In a large skillet heat 3 tablespoons of the oil. Salt and dust the sardines with flour. Fry over moderate heat until golden brown, about 4 minutes. Turn gently to avoid breaking the skin and fry until golden brown, about 4 minutes. Transfer to a rectangular earthenware, ceramic, or glass dish. Lay in the sardines side by side, alternating head-tail directions so that they fit snuggly together. While the sardines cool, in a (non-aluminum) sauce pan, bring the rest of the oil, the vinegar, garlic, thyme, paprika, bay leaves, and peppercorns to a boil. Remove from heat and let cool slightly . Gently pour the marinade (including the herbs) over the fish. Once completely cooled, cover, and refrigerator for at least 1 day and as many as 10. Remove from the refrigerator 1 hour before serving and serve them at room temperature.